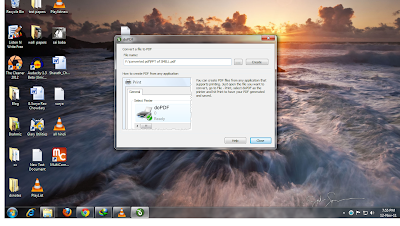 doPDF is a free PDF converter for both personal and commercial use. Using doPDF you can create searchable PDFFile by selecting the "Print" command from virtually any application. With one click you can convert your Microsoft Excel, Word or PowerPoint documents or your emails and favorite web sites to PDF files. doPDF installs itself as a virtual printer driver so after a successful installation will appear in your Printers and Faxes list. To create PDF files, you just have to print your documents to the doPDF pdf converter. Open a document (with Microsoft Word, WordPad, NotePad or any other software), choose Print and select doPDF. It will ask you where to save the PDFFile and when finished, the PDF file will be automatically opened in your default PDF viewer.